Ergh. We all know how much I love Boone from Lost. So when I heard Ian Somerhalder had a new series coming out, Vampire Diaries, I knew I would be all over that. Then I saw the previews for the show, mostly featuring Paul Wesley, who plays Stefan, and Nina Dobrev, who plays Elena. And I started to feel less excited. While the story is not exactly the same, the pilot episode of Vampire Diaries unfortunately feels like a pale reproduction of Twilight--and not in a cool, sparkly pale vampire way. I thought Pattinson and Stewart had great chemistry in Twilight, and really sold the angsty teenager overwrought love story for maximum guilty pleasure goodness. In contrast, Wesley and Dobrev don't feel all that intense or cosmically destined. Elena doesn't seem all that deep, and the 27 year old Wesley sticks out as way too adult to be in a high school setting. 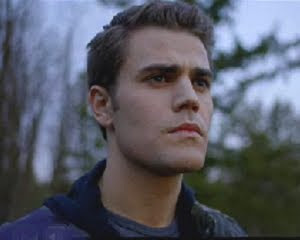 Sure, Stefan's an ages old vampire, so he's bound to seem more mature, but it just throws off the teeny melodrama mood. Wesley also has this tough edge to him, more suited to a Brando-on-a-motorcycle vibe rather than a tortured broken-hearted lover who pours his heart out in a diary every night. It's possible that Somerhalder would have been better in the sensitive role, with his tousled hair, ever-rosy cheeks, and sparkling eyes. (And on a purely superficial note, I have to say that Somerhalder is not quite as striking with dark hair--it's too bad the dark broody vampire look doesn't lend itself to a few blonde streaks to play his eyes up better.) Somerhalder does the arch-eyebrowed villian well, though, and I'm hoping things will heat up for all the characters in later installments. Vampires are hot right now, but there's always the danger of it becoming boring. After you've seen Moonlight, and Twilight, and True Blood, and now Vampire Diaries, the mythologies overlap and you feel like you've seen it all before. I did like in this episode a return to older vampire lore, where Stefan couldn't cross the threshold until Elena specifically invited him in. There's also a new twist, whereby Stefan needs a special ring to be able to venture out in daylight. My first impression is that Vampire Diaries is going to be a somewhat insubstantial teen drama. But it's difficult to judge an entire series on the pilot alone, so I'm willing to stick with it for another episode or two. Stefan and brother Damon (Somerhalder) have a century and a half of sibling rivalry to explore, and there's the mystery of Elena's striking resemblance to Stefan's love from the 1850s. Plus there's biting and blood and murder and all that scary vampire stuff. My beloved Gossip Girl players were a little stiff and caricatured in the beginning of the first season, and then developed into far more complex, interesting, and delicious characters as the series progressed. Here's hoping that Vampire Diaries can do the same, and that we can get into some interesting history, vampire lore, and hopefully some pretty boy love triangles. Vampire Diaries continues next Thursday, September 17, at 8/7c. 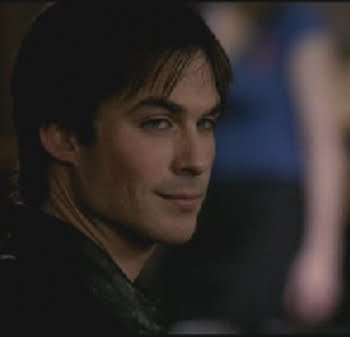 PHOTOS: Ian Somerhalder as Damon, Paul Wesley as Stefan, Vampire Diaries Pilot screencaps, c2009 Alloy Entertainment, CBS Television Studios, CW Television Network.